On Thursday, I have 20 minutes to address 200 people (plus a video audience) at NoSQL Live … from Boston. My self-appointed mission is to start building bridges between the NoSQL community and the Linked Data/RDF/W3C community. These are two sets of people working on different problems, but it’s pretty clear to me they are heading in the same direction, in similar spirit, and could gain a lot from working together. I’m organizing my talk around the question of standardization for NoSQL, and I’ll talk about W3C process and such, but the interesting part is where NoSQL touches RDF. So here are some of my thoughts on that, written for an audience already familiar with RDF. I’d love to get some feedback on the basic ideas now, to make my talk better. SQL doesn’t scale big enough. Once your read-write dataset gets too big for a single machine, you have to develop and maintain a messy sharding system. (But see below.) Sometimes it’s an economy/efficiency thing; if you don’t need ACID, a NoSQL solution might give you better performance on cheaper hardware. Decentralization. On the open Web, data comes from many different sources, mostly beyond your control. Everyone might be providing data to everyone, and no one has the authority to run a central database, ever if they had the technology and the iron. Both tend follow Web Architecture, using HTTP and often using REST. Reading about CouchDB and MongoDB (JSON document databases), as well as Neo4j (a graph database), I noticed an undercurrent about SQL being awkward to program against. I guess this is the O/R Impedance Mismatch, especially the structural differences. RDF’s design is very close to the relational model, so it doesn’t help on this front. Within the RDF community, however, there are some systems which attempt to partly bridge this gap, including node-centric APIs (which I happen to prefer, myself). I would also argue that duck typing closes the gap from the programming-language side. I don’t see NoSQL going anywhere near linked data or having a vocabulary ecosystem. I expect it will want to, someday. Decentralization is a key difference in requirements. I only see RDF dealing with inference. Why is this? My first thought is that the RDF community has a lot of AI roots, and the NoSQL community doesn’t. But maybe it’s about economics and motivations: formalizing the notion of inference makes it possible, in theory, to easily deploy very sophisticated data transformation (and making them complete before the sun goes out). At NoSQL scale, folks are much more concerned about techniques for being able to run even simple transformations (and making them complete before the power bill comes due). I note that AllegroGraph manages to be in both communities, with a very practical, high-performance Prolog element; I don’t know how parallel it is. A few RDF folks are working on using map/reduce. Presumably, with the rise of multi-core systems, even single-user inference engines will want to be made parallel. How many of the reasons for NoSQL rejecting SQL also apply to SPARQL? Does the scaling issue apply? Actually, does the scaling issue really apply to SQL? Michael Stonebraker (more or less the Voice of God) claims automatic sharding can and should be done while still using SQL. Some people reply: Perhaps, but in Enterprise-Grade Open Source? Also, maybe “SQL” is a euphemism for ACID, and that’s really what doesn’t scale and/or is too expensive. Perhaps that issue needs to be settled before considering SPARQL? Actually, the state of ACID in SPARQL is an open issue right now; maybe NoSQL can inform that decision. RDF is standardized. Some would argue it’s more standardized than SQL; that case will be stronger when SPARQL 1.1 is done. Here’s a diagram Steve Harris made, which I reformatted. “KV” refers to key-value stores, the simplest, most scalable kind of NoSQL database. So… What does that all boil down to? Bottom line: RDF could learn a lot from NoSQL about scaling and ease-of-programming; NoSQL could learn a lot from RDF about decentralization and inference. Can someone make a SPARQL endpoint with Cassandra’s performance and scaling properties? I haven’t studied this idea much, but I’m afraid the static column families will make it impossible to get much performance without building the store for a particular set of SPARQL queries. But it could still be useful, even with that drawback. Or maybe some SPARQL endpoint is already there; has anyone really tried a comparative benchmark? How does the SPARQL endpoint description and aggregation work compare to database sharding. Are there designs for doing it automatically? This morning, I gave the keynote address (my slides) at RuleML 2009. I assumed the audience would be fairly familiar with rule systems and rule technologies, but not necessarily with RIF, the Semantic Web in general, or my sense of the future of the Semantic Web (for which RIF is important). I wanted to convey that the Semantic Web means real change, and I wanted emotional impact, so I took a shotgun approach and enumerated a list of likely data sources that was big enough to have some surprises for most folks; then I moved into a long list of things you could do with that data. Some things on the list were boring (having impact only by showing how long the list is), but some got the desired wide eyes and shocked sounds as people realized this just might happen. I think it went over well. Which led into my general scenario: you’re in a store about to buy something, but first you scan it with your phone and look up a little more information about it. What might you look up? Is it’s producer a good corporate citizen? How many houses does its CEO own? Did your spouse/housemate just buy some? Or something like it? hotel room late last night, but I’d like to see it up close. To be clear, when I say “RDF 2” I mean it like OWL 2: an important step forward, but still compatible with version 1. I’m not interested in breaking any existing RDF systems, or even in causing their users significant annoyance. In some traditions, where the major version number is only incremented for incompatible changes, this would be called a 1.1 release. In contrast, at W3C we normally signal a major, incompatible change by changing the name, not the version number. (And we rarely do that: the closest I can think of is CSS->XSL, PICS->POWDER, and HTML->XHTML). The nice thing about using a different name is it makes clear that users each decide whether to switch, and the older design might live on and even win in the end. So if you want to make deep, incompatible changes to RDF, please pick a new name for what you’re proposing, and don’t assume everyone will switch. This is partially a trip report for ISWC, because the presentations and especially the hallway and lounge conversations helped me think about all this. Note that although I work for W3C, this is certainly not a statement of what W3C will do next. It’s not my decision, and even if it were, there would be a lot of community discussion first. This is just my own opinion, subject to change after a little more sleep. Formally the decisions about how to allocate W3C resources among the different possible standards efforts are made by W3C management guided by the the folks who provide those resources, via their representatives on the Advisory Committee (AC). If the direction of the W3C is important to you or your business, it may be worthwhile to join and participate in that process. 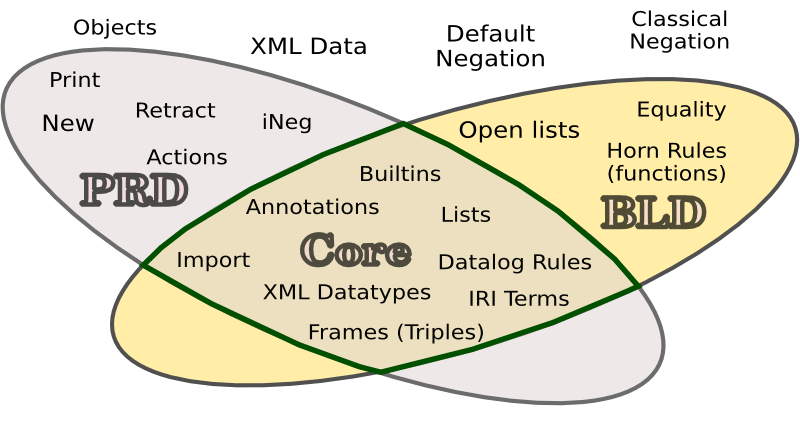 I think we should have better tools for bridging the gap, technologically, so that when data is published in XML, it’s easy for RDF consumers to use it, and when the data is published in RDF, it’s easy for XML consumers to use it. I would also like to see some way to support third-party GRDDL, where the transform is provided by someone not associated with either the data provider or data consumer. Nova Spivack gave a keynote where he talked about this feature of T2. They’re focused on HTML not XML, but the solution is probably the same. Beyond GRDDL, I think there’s room for a special data format that bridges the gap. I’ve called it “rigid rdf” or “type-tagged xml” in the past: it’s a sub-language of RDF/XML, or a style of writing XML, which can be read by RDF/XML parsers and is also amenable to validation and processing using XML schemas. Basically you take away all choices one has in serializing RDF/XML. I note the The Cambridge Communiqué is ten years old, this month. It proposed schema annotation as an approach, and that’s not a bad one, either. I haven’t heard of anyone working on it recently, but maybe that will change if the XML community starts to see more need to export RDF. Amusingly, while I was talking to Gary Katz from MarkLogic about this, he mentioned XSPARQL as a possible solution, and I pointed out Axel Polleres (xsparql project leader) was sitting right next to us. So, they got to talk about it. XSPARQL doesn’t excite me, personally, because I don’t use either SPARQL or XQuery, but objectively, yes, it might solve the problem for some significant userbase. For me, an essential element of a working Linked Data ecosystem is automatic translation of data between vocabularies. If you provide data about the migration of frogs in one vocabulary, and my tools are looking for it in another one, the infrastructure should (in many cases) be able to translate for us. We need this because we can’t possibly agree on one vocabulary (for any given domain) that we’ll all use for all time. Even if we can agree for now, we’ll want this so that we can migrate to another vocabulary some time in the future. Inference using OWL (and its subsets like RDFS) provides some of this, but I don’t think it’s enough. RIF fills in some more, but the WG did not think much about this use case, and there’s might be some glue missing. Maybe we can get WG Note out of RIF to help this along. Some of my thinking here is in my workshop keynote slides, but later conversations with various folks, especially Pat Hayes and TimBL, helped it along. There’s more work to do here. I think it’s pretty small, but crucial. RDF, OWL, and RIF all have hideous primary exchange syntaxes and some decent not-W3C-recommended alternative serializations. I’m not really sure what can practically be done here that hasn’t been done. At very least, I’d like to see a nice RDF-friendly presentation syntax for RIF. A bit like N3, I suppose. I did some work on this; maybe I can finish it up, and/or someone else can run with it. OWL 2 has 3+n syntaxes, where n is the number of RDF syntaxes we have. Exactly one of those syntaxes is required of all consumers, for interchange. I’ll be interested to see how this plays out in the market. Most systems that work with RDF handle multiple graphs at the same time. Sometimes they do this by storing the triples in a quad store, with the fourth entry being a graph identifier. This works pretty well, and SPARQL supports querying such things. We don’t have a way to exchange multiple graphs in the same document, however. N3 has graph literals (originally called contexts), and there was some work under the term named graphs, which is kind of the opposite approach. Personally, I don’t yet understand the use case for interchanging multiple graphs in one document, so I’m not sure where to go with this. Hmmm. I guess RIF could be used for this. You can write RDF triples as RIF frame facts, and the rif:Document format allows multiple rulesets, each with an optional IRI identifier, in the same document. ETA: RIF also gives you an exchange syntax where you can syntactically put literals in the subject and use bnodes as predicates, if you want. But now you’re technically exchanging RIF Frames instead of RDF Triples. When writing software that operates on RDF data, it’s really nice to know the shape of the data you’ll find. It’s even nicer, if software can check to see if that’s actually what you got. And if reasoners can work to fill in any missing peices. The easiest solution might be using rigid RDF. One could probably also do it with SPARQL, essentially publishing the graph patterns that will match the data in the expected graphs. The most interesting and weird approach is to use OWL. Of course, OWL is generally used to express knowledge and reason about some application domain, like books, genes, or battleships. But it’s possible to use OWL to express knowledge about RDF graphs about the application domain. In the first case, you say every book has one or more authors, who are humans. In the second case, you say every book-node-in-a-valid-graph has one or more author links to a human-node in the same graph. At least that’s the general idea. I don’t know if this can actually be made to work, and even if it can, it risks confusing new OWL users about one of the subjects they’re already seriously prone to get wrong. Finally, I’d like some portions of the 2004 RDF spec rewritten, to better explain what’s really going on and guide people who aren’t heavily involved in the community. This could just be a Second Edition — no need for RDF 2 — because no implementations changes would be involved. I’d like us to include some practical advice about when/how to use List/Seq/Bag/Alt, and reification, maybe going so far as to deprecate some of them (IMHO, all but List). Maybe bring in some of the best-practice stuff on publishing and n-ary relations. I understand Pat Hayes would like to explain blank nodes differently, explicitly introducing the notion of “surfaces” (what I would call knowledge bases, probably). Personally, I’d love to go one step farther and get rid of all “graph” terminology, instead just using N-Triples as the underlying formalism, but I might a minority of one on that. ETA: Of course we should also change “URI-Reference” to “IRI”, and stuff like that. Okay, that’s my list. What’s yours? (For long replies, I suggest doing it on your own blog, and using trackback or posting a link here to that posting.) Discussion on semantic-web@w3.org is fine, too. identify ways for governments and computer science researchers to continue working together to advance the state-of-the-art in data integration and build useful, deployable proof-of-concept demos that use actual government information and demonstrate real benefit from linked data integration. I wish they’d said that with fewer words, but, yes, I do know something about that. there is an army of developers, commercial and hobbiest, open source and proprietary, waiting to develop mind-blowing (and genuinely useful) applications using this data. I had a little re-adjustment panic, feeling like there was nothing interesting left to do. Like when you show up to help some friends move, and they’re already done and sitting around eating the pizza. But there’s still lots to do. People who’ve been in Washington a long time assure me it will be many years before a significant fraction of the data is really being published, and, as we well know, getting the data released does not mean it’s easy to use. It’ll be a long time before we have stable feeds of accurate data using appropriate formats and vocabularies. So how do we get there from here? What should the agencies start doing now, to help ease the transition, and get us there faster? And where, exactly is “there”? Our goal, my goal, is to have a scaleable and robust platform for decentralized apps to share their data. Right now, we have a handful of decentralized apps (such as e-mail), but most social software (multi-user apps) runs off a single vendor’s server farm. Yes, youtube, twitter, facebook, google docs, flikr, and others have figured out how to make it work, and how to make it scale, but they still run the systems. We want all that functionality, but without any one organization being a bottleneck, let alone potentially behaving badly. This goal, I should note, is considerably less compelling now than it was when many of us signed up, in some cases decades ago, since we now have an effective app distribution system (with modern web browsers), and a vibrant, competative, and healthy market for these individual centralized services. But some of us still would rather not trust facebook or google with too much of our personal and professional lives. I suspect the government is best not relying on them too much, either. Over the years, the Semantic Web community has been developing a set of techniques, based on open standards, for achieving these goals. They are not perfect, and they are not always polished, but most of them work well and the rest look pretty close. Present all your data in as triples, building everything out of Subject-Property-Value statements. This roughly lines up with rock-solid technologies like relational databases and object-oriented programming, and new techniques, including JSON and terascale databases (Google’s BigTable app engine datastore, Amazon’s SimpleDB). The details are ironed out in RDF, a W3C standard first published in 1999, and then rearticulated with clarification in 2004. When you use triples as your building blocks, you have to be more explicit about the structure of your data, and this eases accurate interoperation. The simplicity also supports metadata, reasoning about data, data distribution, and shared infrastructure even among disparate applications. Use Web addresses (URLs/URIs/IRIs) to name things. Each thing that someone might need to refer to — cities, agencies, people, projects, items in inventory, websites, events, etc — should be assigned a universally unambiguous identifier (nothing else uses the same identifier), so that every source of data about that item can be merged, always knowing it’s the same item. It’s okay (and unavoidable, in some cases) to have multiple identifiers for some items; the important thing is to be able to use the same identifier, when we know it. We use Web addresses to build these identifiers, because we already have a structure for making sure there are no unintended duplicates, and because it allows an important element of of centralization. Each time some organization mints a new web-based identifier, it gets the ability to provide (through its web server) some core data about that item. It’s not that their data will always be correct, but it provides a starting point, a seed around which a shared understanding of the item can grow. The mood of the summit, and perhaps the mood everywhere near technology corners of the White House, seems to be one of ecstatic urgency. Folks seem to think everything can and should be done at a record pace, with crowd sourcing and agile development. The perfect is the enemy of the good. Get something good out there, then refine it. Fail early, fail fast. This is awesome…. but how do we iterate from here to a fully-evolved linked data ecosystem? And let’s not just assume the crowd will do all the right things. Get more and more public data streams flowing. Make the data streams more and more usable. I don’t have any insights into part 1. That’s political, whether it’s workplace politics or national politics. I don’t know if there are any shortcuts. The case just has to be made, better and better, in all the right places, until the right stakeholders and decision makers and people who really do the work are convinced. But part 2 can be crowd-sourced. It can be turned into a market, a community effort. Put my pictures of my latest family vacation on the web, where my friends and family can see them. Let my mother put her pictures of the same events there, too. Let me select some for my friends to see, and her select some for her friends to see. Know that the pictures will be there, safe, for as long as anyone in the family wants them to be. Put my movie collection on the web, so I can watch my movies wherever I happen to be, and so can my kids. If one of them is at a friend’s house, why should it matter if she remembered to bring the DVD, if the house has a good network connection? Borrow my friends’ movies and music from time to time. If I want to watch some old college favorite (let’s say Heathers), and I know my friend Keith has a copy, must I drive 20 minutes to his house to borrow his DVD? No, I want him to have it on his server, and let me borrow it. (Note that I’m not asking to make my own copy. What I want might or might not break some laws, but it seems to me that if I can legally borrow his physical DVD for a few days, I should also be able to legally borrow the bits on his DVD. As long as there’s still only one working copy at any point in time, I expect the MPAA wont be quite so furious with me. I want this copy-protection to be only advisory; if Greg borrows my copy, and somehow loses it or it breaks, I can just reclaim it. If he finds it again, his copy is an illegal one. There’s no need for security here (someone would just crack it anyway); I just want to make it easy for people who want to follow the rules to do so, and I hope the system would usually make it easier to follow the rules than to break them. I want this to be private. I’m talking about sharing with my friends here, not sharing with the world. I may not want the world looking through the family vacation pictures, and I don’t want strangers borrowing my movies if it’s going to prevent me from watching them. I certainly don’t want strangers copying movies I paid for if it’s going to make the MPAA apoplectic (as I’m sure it would). I know: youtube, myspace, flickr and their less-popular but more-exciting rivals offer something like this. But I want it decentralyzed. When I say private, I mean private from everyone, including Google and News Corp and Yahoo/Microsoft. And when I say I want the pictures to be there, “safe”, more-or-less forever, I don’t just mean until some corporation decides to change its terms of service, or capriciously enforce some clause I never noticed. I picture the server software being pretty simple (web+db), and something any web hosting provider could offer with one-click installation. Like wordpress, etc, but even simpler. The point is that if you want your own locker/island, you could rent one for $5/mo (low end) to $50/mo (high end), from commodity providers. The data would be stored encrypted, so the host computers and hosting services never get to see what bits are really stored. They can’t see the family pictures or hollywood movies, even if they want to, no matter their terms of service or pressure from the government. The clients would be more than just browsers. They have to understand the media tagging and indexing, and handle the crypto. They’d probably offer discussion boards, and such, as part of the media metadata. A purely web-based client would allow users an experience very much like flickr and youtube. It could show ads, and it would know your encryption keys, but at least it wouldn’t be hosting the media data, so you could move from one to another without risk of losing your photos, music, and movies. A plug-in for a media player like VLC. A command-line, virtual-file-system client. This is the kind of thing I might hack together as a prototype, using fuse. All the lockers to which I have keys would appear as a big filesystem, and there would be some tools for searching and manipulating it. I could use my existing media players, unmodified. (in my copious free after-hours time)? RIF is done, more or less. When I say “done”, I don’t mean “done” like toast in the toaster is done, when it’s just perfectly crunchy, without quite being dry or hard. And I don’t mean “done” like a hacking project which is done at that precise moment when it stops being more fascinating than sleep or food or sunshine. No, RIF is “done” like a term paper, the night before it’s due. It meets the requirements, more or less, and the time has come to ship it. Of course, the W3C process favors quality over speed, so instead of turning it in and walking away, we’ll have to do several rewrites, to address the teacher’s comments. In this case, we have at least three rounds of that. In the first round (called “last call”, which started last friday), the “teacher” is anyone who feels like reading and commenting. Then comes “candidate recommendation”, when we try to get everyone to implement it and give us comments as they do. (This is where OWL 2 is now). Finally, we’ll ask for a high level review from all W3C member organizations, as they decide whether to promote it from Proposed Recommendation to a full W3C Recommendation. But still, it’s done like that term paper. It’s turned in, and now we wait for the review comments. So what is RIF good for, anyway? We need RIF so that we don’t need standards any more. [ foaf:name “Sandro Hawke” ] ? Who knows? How can anyone decide? It’s a mess. And, of course, this problem is repeated everywhere. Every ontology has its share of coin-flip design decision — decisions where you have no overwhelming engineering reason to make one choice over another. And every problem space has, or will soon have, a vast array of ontologies addressing it from many slightly-different angles. I want data providers to publish using whatever ontology they know and love. I want data consumers to consume (use) data in whatever ontology they know and love. I expect RIF to be the glue in the middle, behind the scenes, in a fuzzy ball of linked-data rule-engine goodness. Imagine Jos publishes using foaf:firstName and foaf:surname. Imagine Chris publishes using foaf:givenname and foaf:family_name. Imagine Gary writes an app which looks for foaf:name data. As long as the right RIF rules are present on the Web, in the right places, this should work. People using Gary’s app should see the data from Jos and the data from Chris, even though Gary never knew or cared about the vocabularies they used. Of course, there’s some question as to what those rules should say. In the US, the givenname and the firstName can be treated as the same. Meanwhile, in Japan, the family_name is the firstName! And if you try to split a name back into firstName and surname, do you use the last space (as in “Sarah Jessica Parker”) or the first space (as in “Hillary Rodham Clinton”)? I think the solution is to accept that there may be multiple rulesets, suitable for different purposes, and they may not be perfect. I explored this space to some degree in a different context: XTAN associates some “impact” (which might be called “semantic damage”) with each transformation (or ruleset). I think that can work. So, there are still some details to work out. I’m not presenting the solution here; I’m just explaining why RIF interests me. Now you know. I’m at SFO with three hours to kill, and not many brain cells left, after spending the week at the Semantic Technologies Conference. I am, it turns out, so short on functioning brain cells that I’m writing a blog post, after all these months of self-censoring because I didn’t have anything worth saying here. The dominant question at SemTech was whether we’ve finally reached the point in the adoption curve where (to mix 2d curve metaphors) it’s all downhill from here. Has this thing really caught on? Can we just coast and let the Semantic Web take over the world now? I still think there are some vital pieces of the architecture missing, but I can’t deny that more and more people seem to “get it”, and be spreading the word. People I’ve never even heard of. That’s a pretty good indicator. Of course, maybe they don’t really get it. I’m not quite sure anyone really gets it, since they don’t seem to notice those missing pieces. I was happy to see Evren Sirin talking about their work at Clark and Parsia on using OWL for integrity constraints. I’m not sure they’ve got it quite right — it’s hard to tell — but I’m really glad they are trying. The divisions within the community are still great. You have the rules folks, who really don’t get this whole Description Logic thing. You have the Description Logic folks who usually try to not be too condescending to the rules folks. We have the natural language folks, who I still mostly ignore. RIF is pretty badly misunderstood and mis-characterized. That might not be my fault, but it’s kind of my responsibility. As one step, I put a little more time into starting a RIF FAQ this afternoon. Feel free to send me more questions that I don’t know how to answer. Allegro Graph 4.0 filled me with triplestore lust. I don’t know if it could live up to the impression Jans painted of it, but … I want one. Interestingly, I didn’t feel envy; perhaps I’m also ready to give up on the fantasies of writing a killer triplestore. In the Semantic Search session, David Booth and someone I don’t know separately expressed the concern that computers are getting too smart for our own good. Not really in the Skynet sense, but in the sense that when google tweaks their algorithms, in ways even they don’t understand, or the web just shifts a little, suddenly you can’t find some page any more. I thought Peter Norvig looked apologetic, when he responded with a terse “use plus as a workaround!”. I need to remember that more, when I get frustrated with Google not really doing keyword searching. Conclusion: make sure the compu-smarts always have an off-switch, and that humans never forget where the off-switch is. Data Portability. Wow, is this a difficult space. I am not optimistic here, either. I think we have many years of stumbling around in our future on this one. And that’s even if facebook isn’t being evil. On the plus side, the community is starting to realize what a hard problem it is. I’ve heard that admitting you have a problem is a good place to start. Still, the meme that there exists a quick solution, if we just get a few smart people together, … it’s damn compelling. And here we are, going backward in time, back to the first session I attended, Monday morning, from some freebase folks (Jamie Taylor and Colin Evans). I should play with freebase more. If I ever get back to playing with scripts to manage my movie collection, I should probably use their movie data instead of IMDB. Jamie kept saying great things about W3C; I wanted to ask him why they don’t just join, but though I saw him many more times at the conference, he was always walking by in a hurry. It’s not like I could have made much of a case, anyway. One of the problems with the W3C’s current business model is that folks no longer join W3C just because they (a) use our stuff, and (b) think we’re cool. They actually want business value in return for their dues! Losers. Speaking of W3C, OWL 2 went to CR last week. I think that was my most challenging round of publications yet. Do I say that every time? Still, stepping in as editor of rdf:PlainLiteral, and doing the whole transition process, in the midst of a getting a new manager, … it was challenging. I’m not actually worried about the CR phase itself. OWL 2 looks pretty darn good. Until SemTech, I was a bit worried about us getting RL implementations, but several people mentioned they planned to try it, and after a while I realized it’s kind of a no-brainer. If you play in the SemWeb space and have a rule engine (as many folks do), why wouldn’t you give OWL RL a try? Of course, you might not get around to running all the test cases, and reporting back by July 30, but at this poing I’m no longer very worried about it. Okay. One hour to flight time. That’s better. Have fun on the ground, everyone.